Though many people attending Bungay Balls Up will be far too busy sitting down, relaxing and eating cake to do something as active as juggling, should you wish to get in a bit practice during the week we provide a large big top tent. Prefer watching to taking part? A corner of the Big Top is always setup with comfortable chairs and sofas, whether to aid your relaxation or for taking part in an impromptu quiz night. 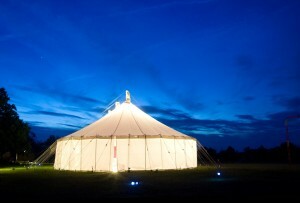 With a sound system and eco friendly LED lighting the big top is open 24 hours a day, no matter what you use it for. There is also plenty of space in the surrounding buttercup fields for the most active of jugglers and spinners!